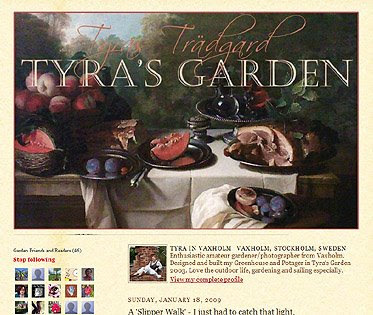 Tyra's Garden is a small garden on the island of Resaro. Resaro is situated in the inner part of the archipelago near the small town Vaxholm, outside Stockholm. Tyra's Garden is mostly an ornamental vegetable garden, my portage. But flowers are of course an important ingredient, for beauty and pollination. The climate in these parts is quite demanding as the northerly winds can be strong and cold. This blog is not entirely a garden blog it contains much more. You will meet Tyra's world.